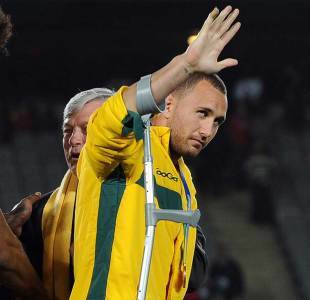 Australia fly-half Quade Cooper has criticised the Wallabies' tactics during the World Cup in New Zealand. The 23-year-old, who is currently recovering from a knee injury, had a subdued Rugby World Cup after starring for the Reds as they won the Super Rugby title earlier in the year. He came in for much criticism for his displays in New Zealand, particularly during the pool defeat to Ireland, although the Wallabies did ultimately finish third in the tournament. "I went out there and played the football I was allowed to play inside a game plan," Cooper told Australian Associated Press on Saturday. "It might not have necessarily been the best game plan. "There was half the games that we didn't play very smart. Whether that was on the back of my shoulders, who knows? "I think there was a time where we may have been over-thinking," Cooper added. "Because when we came out in that game against Wales we basically said let's just go out there (and enjoy it). "You can have all the words and all the motivational quotes and moves in the world but if you're not going out there and putting your heart and your mind into it with your team mates you're not going to play well. We just went out there and played some good football."